Today in Class 1 we enjoyed learning about New Zealand. The children were very helpful looking for New Zealand on the map. After learning a little about New Zealand animals and food the children were introduced to the Taniwha (New Zealand monster). We had a lot of fun making the Taniwha mask and playing a short Taniwha game. It was great to see all the children taking an interest in New Zealand and speaking a lot of English. Today in Class 4 we had lots of fun making craft. 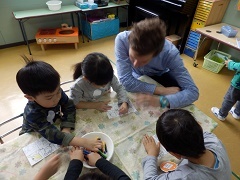 I was very surprised some of the children knew, “Double Decker bus” and that you can see them in the “United Kingdom”. Everyone did very well cutting their buses and windows, colouring the characters from England (Peppa Pig, Winnie the Pooh, Harry Potter and Paddington Bear), before gluing them all onto their buses. All of the children did a fantastic job and used lots and lots of English. Great job everyone! Today in Class 7 we had a nice time making a Halloween craft. The children used cotton swabs as “bones” to make skeletons. They could draw faces, cut out the heads, hands, and feet, and then glue everything down. Gluing the cotton swabs was a little tricky but everyone tried hard. Each skeleton was original and looked unique. 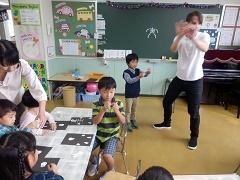 After the craft, we had lots of fun doing the “Skeleton Dance” together. I am so happy we could have fun together!